Air Care Alliance // Moving Forward! The Air Care Alliance has a major objective of maintaining a list of all the volunteer-based public benefit flying groups and referring those persons needing aviation transport or services to those groups serving their needs and geographical areas. Usually site visitors simply look through the long list until finding one or more groups serving their area, but this is a tedious process. Each year we send each group a form showing the current information we have on file, and ask for any updates or changes to be provided back to us. This will be even more important very shortly, because we are about to launch our new website which includes an interactive "Find a Group" module that depends on accurate information about each group. A site visitor soon can fill out a simple form and the system returns a list of all the groups fitting the visitor's needs and destinations. The visitor can forward the information to specific groups by clicking on a button next to a group's listing. When we launch the site we expect that some groups may receive inappropriate requests because we have not received updated information in spite of our annual requests. Feel free to visit our current listings and see if the information for your group is correct. If you wish to provide an update, please use this form and send it as noted - no dues are required. The page also provides a bit of information about the benefits of Membership in ACA, which includes the opportunity to collaborate with representatives and volunteers from other groups and help us all work together to promote public benefit flying and to build strong relationships with the various aviation associations and the governmental organizations responsible for regulating our flights. For those groups not yet ACA Members the forms provide that option too. In addition individuals and companies can also use the form to become supporting Members of ACA. And when you have the opportunity - please remember to thank all the current Member groups of ACA and our other supporters for their efforts and help benefiting all our public benefit flying organizations and the work of our volunteers! 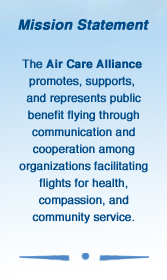 In the coming months you will see a new look to The Air Care Alliance. We have updated our logo to make a cleaner, more identifiable brand for our organization. We hope to capitalize on this new look in all our marketing materials and in the upcoming launch of our new website. Please use the link below to update your individual websites with our new logo to reflect the new look! The new logo was designed by Angel Flight West graphic artist, Tim Pavell. Tim's efforts were sponsored by Angel Flight West and we very much appreciate their generosity in providing Tim's services in developing this new logo. The process has been ongoing for several weeks when Tim provided several draft ideas for the logo. Once the team decided on the basic design, we set about looking at colors and tweaking the details to provide a logo that accentuates the aviation side of the organization. We tried to think of how to encompass "compassion" in a logo and found that the breadth of our compassionate activities was too broad to encompass in a simple logo design. What we all have in common is aviation so we focused on that as a design concept and Tim captured it in a very striking way. Thanks to the team, to AFW and to Tim for working together to come up with this new look. Please use the links below to update your individual websites with our new logo to reflect the new look! 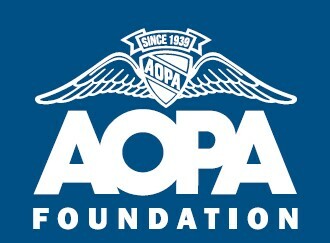 The Air Care Alliance is pleased to announce that we have been named as one of the ten recipients of the inaugural AOPA Foundation Giving Back awards! 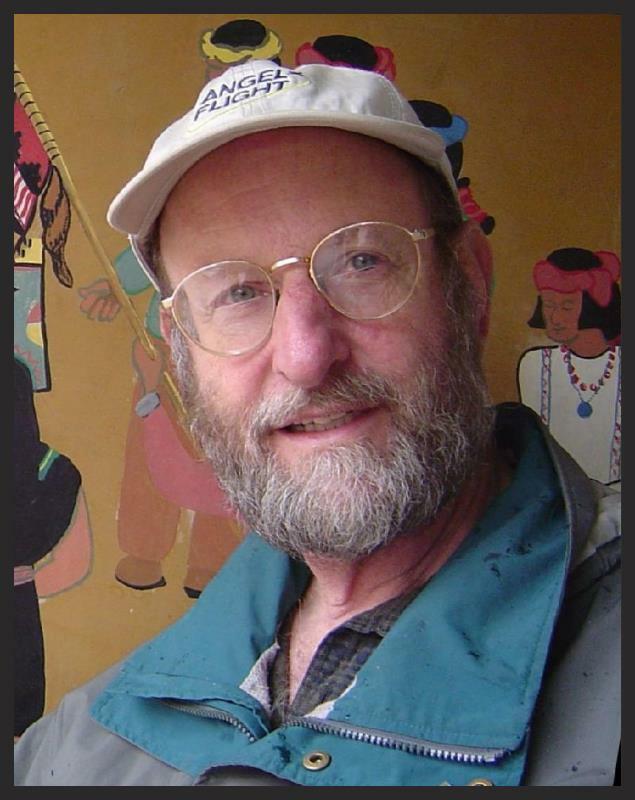 We were informed of the decision in September by Adam Smith of AOPA. This sentiment was surely prevalent with the award committee as evidenced by the large number of the recipients being members of the ACA and participants in Public Benefit Flying. Along with the Air Care Alliance, the other recipients were: Pilots N Paws; Challenge Air for Kids and Friends; Duluth Aviation Institute; Girls Inc.; Kentucky Institute for Aerospace Education; LightHawk; Recreational Aviation Foundation; Veteran's Airlift Command; and Young Aviators. For demonstrating extraordinary commitment, generosity, and dedication to countless patients and to the mission of Angel Flight East for more than 13 years as a pilot, organizer, and Board Member. For creating a network of volunteer aircraft owners, operators, FBOs, and pilots donating their time and resources to alleviate suffering after disasters, most recently following Hurricane Sandy. Whose Hurricane Sandy response was critical for the welfare of affected East Coast residents and which set a new standard of service for future natural disasters. In recognition of their thirty year partnership employing flying eye hospitals and medical personnel in public benefit flying to fight blindness and vision impairment around the world. For its online course "Public Benefit Flying: Balancing Safety and Compassion," enhancing public benefit flying's safety culture by helping volunteer pilots manage risk and avoid harm. For more than 25 years raising funds for organizations flying cancer patients and wounded warriors, and for educating future aviation leaders, while bringing the entire aviation community together "Fore a Great Time...Fore a Great Cause." This year's awards were presented at the National Aeronautic Association (NAA) Fall Awards Banquet, held on Tuesday, November 17, 2013, at the Crystal Gateway Marriott in Arlington, VA.
National Aeronautic Association President & CEO Jonathan Gaffney and ACA Chairman Rol Murrow presented the awards to recognize the contributions of volunteer-based Public Benefit Flying and the outstanding work of individuals and groups engaging in this humanitarian activity. Also representing ACA at the event were our ACA President Lindy Kirkland and Treasurer Jeff Kahn. Normandy Farm Hotel and Conference Center in suburban Philadelphia will be the venue for the 2014 Air Care Alliance Conference hosted by Angel Flight East. Grab your calendars now and ink in the dates of Friday and Saturday, April 25-26, 2013, for two great days with your charitable aviation friends and colleagues. We have obtained a very favorable room rate of $129.00, plus tax, per night. This rate will be available from Thursday night the 24th through Sunday night the 27th for those who may want to enjoy the area. Center city and its historic areas are easily accessible by car or commuter train and the world famous King of Prussia Mall is also nearby. Attendees are also welcome to book a round at the neighboring Blue Bell Country Club's 18-Hole Arnold Palmer signature designed golf course. We are planning a reception on Saturday night at the historic Philadelphia Aviation Country Club (www.paccwings.com) at Wings Field, the birthplace of the AOPA. Normandy Farm is easy to get to by car or shuttle from Philadelphia International Airport and if you plan to rent a car, you might check on flights/fares to Lehigh Valley International Airport in Allentown, less than an hour from the hotel. For private aircraft, Normandy Farm is also less than 4 miles from Wings Field (KLOM, 3,700 Ft.), and nearby Northeast Philadelphia Airport (KPNE, 7,000 Ft.). Of course you will also enjoy the camaraderie of your public benefit flying friends from across the country as we experience together the fun activities planned and the sessions that will deal with the issues you confront in providing leadership for your charitable aviation organization, as well as current aviation matters that impact your daily operations. Many more details to come later. See you in Philadelphia in 2014. Save the dates now! Please help us provide accurate information on aviation activity and aviation safety. The 35th annual General Aviation and Part 135 Activity Survey (GA Survey) for reporting on calendar year 2012 began in early June. The FAA's annual GA Survey is the only source of information on the general aviation fleet, the number of hours flown, and the ways people use general aviation aircraft. These data help to determine funding for infrastructure and service needs, assess the impact of regulatory changes, and measure aviation safety. The GA Survey is also used to prepare safety statistics and calculate the rate of accidents among general aviation aircraft. If you were selected to complete this year's survey, you received a postcard invitation to participate in the GA Survey in early June. You can complete the survey on-line, or use the survey form mailed to you along with a postage-paid envelope. We need your help so that we can prepare accurate estimates of aviation safety. Data from this survey are used to calculate fatal accident rates for general aviation and Part 135 aircraft. Your responses are confidential. 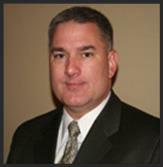 Tetra Tech is an independent research firm that conducts theGA Survey on behalf of the FAA. The information will be used only for statistical purposes and will not be published or released in any form that would reveal an individual participant. A short version of the survey form is available for owners of multiple aircraft. We know your time is valuable. If you own three or more aircraft and receive several surveys, please contact us. Questions? Own three or more aircraft? Please contact Tetra Tech toll-free at 1-800-826-1797 1-800-826-1797 or email infoaviationsurvey@tetratech.com. Thank you!